Vector Arena is a 12,000-seat arena for sports and entertainment events in Auckland, New Zealand. Named for a sponsor, Vector Limited, the arena is located at Quay Park, Parnell, very close to the former Auckland Railway Station. Vector Arena cost around $80 million, and of this sum ratepayers contributed $68 million for the facility to be managed by QPAM, the NZ operator, in New Zealand first big public-private partnership. This runs for 40 years before ownership is transferred to the city. After delays due to construction-related issues, the arena's first concert was Rock Star Supernova on 24 March 2007. The Red Hot Chili Peppers – 21–22 April 2007, with Har Mar Superstar and 14–15 January 2013, with Off! The Smashing Pumpkins – 22 March 2008, with Queens of the Stone Age and 4 August 2012, with Die! Die! Die! 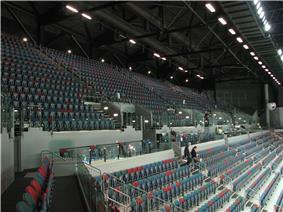 The seating inside the arena. 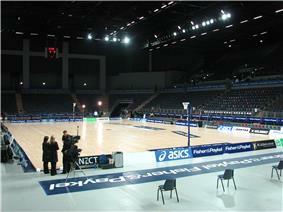 The Arena in a netball setup. Other performers such as comedians Jeff Dunham, Patrick Motion and Russell Brand have performed at the arena. Mike Tyson was due to bring his Day of Champions tour the Vector Arena in 2012, but he was not granted a visa to enter the country due to his previous criminal convictions. Scheduled to open early 2006, this was first delayed towards the end of 2006, when a second opening date was again missed. The delays were apparently due to the Arena's builder, Mainzeal, having various problems with the structure, especially with the roof, where the 120 m main truss had to be strengthened, and where added insulation to waterproof the building against the humid local climate had to be included. In a related issue, extra ventilation also had to be installed to prevent internal humidity build-up during full-capacity events. The construction company reportedly faced huge losses on the project, and planned to sue the architects for partial compensation. Dave Rat, the sound engineer of The Red Hot Chili Peppers, has criticized the sound quality of the venue after the band played concerts in the Arena during April 2007. He noted that the echo from the curved roof was problematic, and that acoustic panels would need to be installed to improve the arena, especially for those listeners on the upper seating levels. He also criticised the polished concrete floors as too slippery for mass events. Chris Tate(College Hill Limited), sound designer for Rockstar: Supernova's first concert at the arena, has however noted that the acoustics were better than expected, and could be improved further. It was also noted that such work is already in preparation. Netball is regularly played at the venue with the New Zealand Silver Ferns playing on several occasions while the ANZ Championship has also used the arena on two occasions since 2010. The arena hosted the 2012 Fast5 Netball World Series. Since 2008 Vector Arena has also been a regular host of World Wrestling Entertainment's tours of New Zealand, with Raw, SmackDown and ECW all performing at the venue. In 2011 some 10,000 fans saw an Ice Hockey international between Canada and the United States on a $4.2m temporary ice rink. Vector arena announced that it would host its first National Basketball League game on 28 October 2011 when the defending champion (and Auckland based) New Zealand Breakers take on the Sydney Kings in Round 4 of the 2011–12 NBL season. The Arena hosted two more Breakers games during the season, against the Townsville Crocodiles in Round 8 (24 November) and the Kings in Round 17 (27 January 2012). That first NBL game at Vector Arena drew a New Zealand record crowd for a basketball game when 6,900 saw the NZ Breakers defeat the Kings 76-59. This record was again broken in Round 17 of the 2011-12 season when 7,979 saw the Breakers again defeat the Kings 93-64. On 13 March 2012 New Zealand Breakers General Manager Richard Clarke announced that due to the amount of support for the team (which is more than double the capacity of their regular home venue, the 4,400 seat North Shore Events Centre), that all Breakers finals games would be played at Vector Arena with capacity set at 8,500, subject to demand, with extra seating to be sold if needed. The Breakers finished the 2011-12 season as minor premiers giving them home court advantage in the Semi-finals and Grand Final (if they qualified). The Breakers qualified for the 2011-12 NBL Grand Final against the Perth Wildcats with games 1 and 3 being played at Vector. Game 1 saw the attendance record broken when 9,125 showed to see the Breakers win 104-98 in overtime. With the Wildcats winning game 2 in Perth 87-86, game 3 was required and the NZ Breakers won their second straight NBL Championship with a 79-73 win in front of yet another record attendance of 9,285. 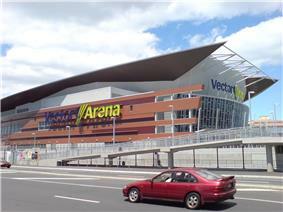 Before the 2012-13 NBL season, the Breakers confirmed that they will play 5 regular season games at Vector Arena. The first game, played in front of 6,625 fans, saw the home side defeat the Adelaide 36ers 73-59 on 12 October. There were four other games at the arena during the regular season, on 16 November (Townsville), 13 December (Cairns Taipans), 1 February 2013 (Perth) and 14 March 2013 (Melbourne Tigers). The Breakers once again broke their attendance record during Game 1 of the 2012-13 NBL Grand Final series against the Perth Wildcats when a capacity 9,330 fans saw the home team defeat the Wildcats 79-67. The NZ Breakers won their third straight NBL Championship by wrapping up the series with a 70-66 win over the Wildcats in front of 13,527 fans at the Perth Arena. For the 2013–14 NBL season, the Breakers will play half of their home games at Vector Arena, totaling seven appearance at the arena. These are the season opener against Wollongong (10 October), round six clash against Adelaide (15 November), round seven clash against Townsville (November 22), round 10 clash against Perth (13 December), round 16 clash against Sydney (30 January), round 18 clash against Cairns (14 February) and round 23 clash also against Cairns (21 March). The Breakers will both start and end their ordinary season at Vector Arena. The Breakers game against the Adelaide 36ers on 15 November 2013 saw the home sides first ever loss at Vector Arena. The Breakers led 94-93 with just over four seconds of the game remaining and had the inbound pass due to a time out. However, 36ers point guard Gary Ervin stole the inbound pass and drove the length of the floor to score a layup just before time expired to give the 36ers a 95-94 win in front of 7,470 fans. The Breakers then lost their second game at the venue when they were defeated 71-62 by the Perth Wildcats on 13 December 2013 in front of 7,597 fans. As a measure of the teams it took to finally defeat the Breakers at Vector, the Wildcats and the 36ers would go on to play in the 2013-14 NBL Grand Final series (won 2-1 by Perth). ^ a b Orsman, Bernard (12 December 2006). "Secret update for council on troubled Vector Arena". ^ Gibson, Anne (11 April 2006). "Arena workers back on job after roof problems". ^ a b Gibson, Anne (6 January 2007). "Troubled stadium tipped to open in March". ^ Gibson, Anne (6 March 2006). "Red ink reins in builder Mainzeal". ^ a b Hunkin, Joanna (26 April 2007). "Chili Peppers' sound man: Vector Arena not good enough". ^ Guerin, Michael (24 July 2011). "Ice Hockey: Pucking good time on the ice".